In the textile industry of Bangladesh, there are a lot of woven dyeing, knit dyeing, yarn dyeing and finishing factories. All of those have great importance in our readymade apparel export-import business. To know the top dyeing factory name, I have listed here a list of top twenty dyeing factory in alphabetically. Please don’t forget to write your valuable comment about this list. If you have any query related with this list, you can submit us your desired factory name. The article will be updated according to your opinion. 10. 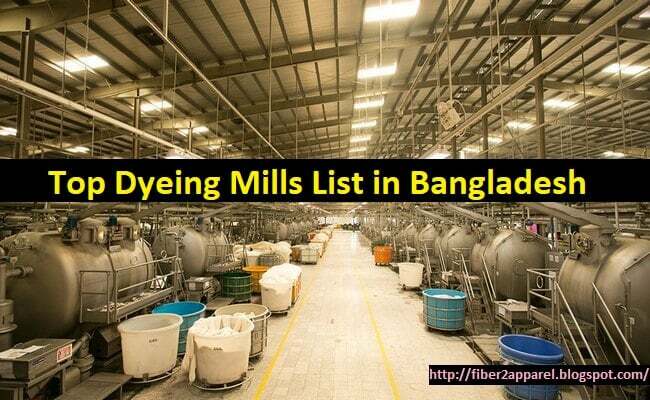 List of Top 20 Textile Industry in Bangladesh. 3. Amber Yarn Dyeing Ltd.
Head Office Location: Plot- 68-71, Block- K, Section- 2, Rupnagar, Mirpur, Dhaka. Factory Location: West Shoilodubi, Kashimpur, Joidevpur, Gazipur. Factory Location: Bada Kalmasher, R. B. Bazar, Gazipur. 9. Mondol Yarn Dyeing Ltd.
Plot- 15, Sector- 3, Uttara New Model Town, Uttara, Dhaka- 1230. Road- 113/A, Gulshan- 2, Dhaka- 1212. 12. Savar Dyeing & Finishing Ind. Ltd.
14. South China Bleaching & Dyeing Factory Ltd.
109-112 Dhaka Export Processing Zone, Ganakbari, Savar, Dhaka- 1349. Flat- A-5 (5th Floor), Road- 20, New DOHS, Mohakhali, Dhaka. 115-120 Motijheel C/A, Dhaka- 1000. 17. Tamishna Dyeing Industries Ltd.
18. Thermax Yarn Dyeing Ltd. Factory Location: Noapara, Tarabo, Rupgonj, Narayangonj. Sector- 04, Uttara, Dhaka- 1230.